Ralston's BIOSAK is a compostable bag made from a new generation of BioPlastic derived from renewable resources. The bags become compost with food waste when processed at municipal composting facilities. New technology locks moisture transmission keeping the bag and container dryer. BIOSAK is for use where approved by Municipal Compost Programs and is Certified compostable by the BNQ 9011/11 and Biodegradable Products Institute. 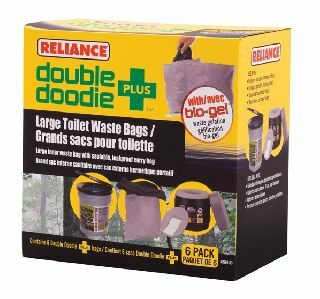 Double Doodie Plus Waste Bags is rated 5.0 out of 5 by 1. Rated 5 out of 5 by kathy g from Product was as descibed I ordered this product online and it was shipped free of charge to my house. I was shipped in a random box not in the box of this picture which confused me but the bags were inside. Worth every penny.